Once Imperial forces left Barcelona and Philip V began his siege of the city in 1713 the Catalans had between 200 and 300 gunners to serve their guns - not a large force for so large a task. However the Bourbons were also initially short of artillery, and on 25th October a contingent of troops from Majorca arrived which included a further 53 gunners to bolster the city’s defences. Nevertheless with assistance from the French the besiegers gained considerably in strength, and as the noose tightened around the defenders during 1714 a further 200 gunners were raised by taking them from ships in the harbour. As in any siege, artillery was a major player in this long action, but ultimately the guns fell silent when the city was taken by the Bourbons. Besieging a city requires numbers of heavy guns to make a breach in the defences, but the defenders generally need lighter guns which can be moved around the walls and elsewhere to fight off any assaults, and most of the Catalan artillery was of this type. The gun in this set seems to be of a medium calibre, although exact identification is not possible. Like the uniformed gunners it is fairly typical of the time and suitable for this subject. For a set labelled as 'artillery' the first surprise here is the gunners, all of which can be seen in the first row. The one solitary gun is served by just three men, one of whom is an officer with a halberd. The second man seems to be carrying a ramrod or mop/sponge, while the third is curious in that he is kneeling and holding what looks like a sword, while another sword is still to be seen in his scabbard. Therefore we only really have one man actually working the gun, which is hardly what you would expect from an artillery set. The second row contains a drummer and a most unusual pair. The manufacturer says the drummer can be an addition to the infantry sets in this range, which is certainly true, and artillery regiments did have drummers themselves, but if this pose is at the expense of a true gunner then we would have much preferred to see the latter. Beside the drummer is a truly remarkable model. It is of two men engaged in the most close-quarter combat you could wish for. They are literally wrestling, with the man on top trying to injure his opponent with a dagger. The model is very well done and amazingly is all one piece - there is no assembly and no gluing! Naturally a soft mould has been used, but even so this is remarkable as there is no excess plastic to remove. While it is dramatic some may struggle to find a use for such a piece, although we generally like such unusual items and such fights could certainly have occurred, particularly once the Bourbons broke into the city. Just as much of a surprise is the gun, which is also done in just one single piece. Carriage, barrel and wheels all are one piece, which is certainly the first time we have ever seen such a thing done in this hobby. Despite that the detail on all the figures is pretty reasonable, and while there is a somewhat rough quality to them the gun in particular is as well detailed on all surfaces as most multi-part guns yet produced. However it should be noted that the plastic used for all the brown items pictured above is the usual soft compound used by GerMan, which makes vulnerable parts such as weapons and ramrods prone to breakage. The sculpting style is not elegant but detail is good and the figures are not unattractive. The barrel, bucket and pile of shot accessories are the standard fare for such sets, although again the bucket has been achieved as one piece. Dominating the whole set is the large grey diorama piece. Apparently this represents part of a square in Barcelona which was fought over repeatedly at the end of the siege. It measures an impressive 205mm in length and 122mm wide, and once again is in one piece apart from the brick arch, which is easy to add. 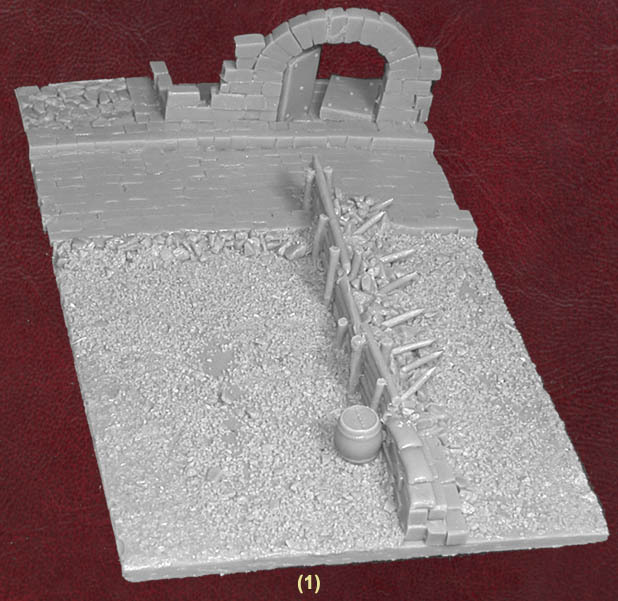 Made of resin, it is hard and far more sturdy than the figures, and offers an excellent backdrop for placing figures and guns. GerMan say this is part one of three pieces which will combine to form a large model of the square, with the other two parts to come in later sets. It is really well done and could have many uses in all manner of scenarios far beyond the War of the Spanish Succession. Apart from some paper flags the only other component in this set is a data CD which contains a number of very useful items. First is a fair history of the Barcelona campaign along with extensive notes on the Catalan regiments involved and full details of uniform colours and flags. Also on the disc is a separate guide to the uniforms of the participants and a large number of flag templates which could be printed off and used on the figures. Much of the information and most of the illustrations are taken from the excellent Hernandez/Riart book listed below in our bibliography, although the CD has the advantage of being translated into English. Notes for wargamers are also included, along with some inevitable advertising by GerMan of other sets in this series. Nevertheless modellers and wargamers will find this a remarkably useful resource, and a valuable introduction to the subject for anyone that cannot read Catalan or Spanish. In summary then this set contains many good things, but it must be said the actual gun and gunners are about the least of its parts. GerMan say that other sets will deliver more artillery to make up for the scarcity of them here, and this seems to be the philosophy at work here - an individual set is not so much covering its subject as an instalment in the wider collection. Whether you approve or disapprove of that approach will depend on what you want to do with these figures, but it is worth knowing what the box contains before parting with your cash. The barricade piece is excellent and the CD really useful, but the gun is only reasonable and the figures most notable for the tiny number of suitable poses. Others have done artillery of this period much better, so while this set has much to offer (which is not reflected in our standardised scoring system), the figures themselves contribute very little to that.